The skeleton of a long gone Spruce tree is split by two smaller Aspen trees. 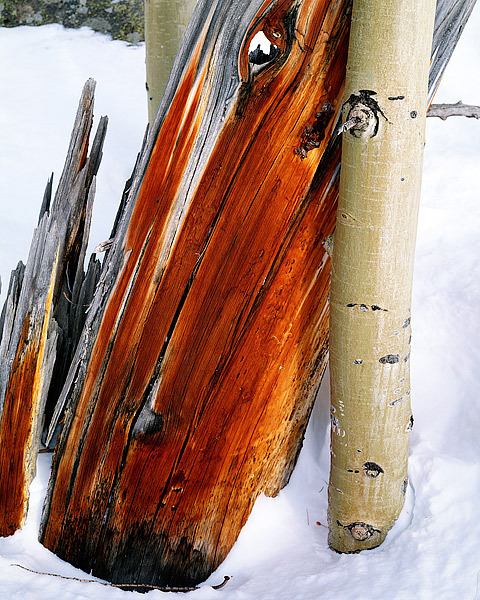 The trees, located near Bear Lake in Rocky Mountain National Park are surviving through the Winter. Nearing the end of a Colorado Winter, these trees near Bear Lake are covered with three to four feet of Colorado snow. It wont be until early July that all the snow around Bear Lake and in the higher elevations of Rocky Mountain National Park will completely thaw and melt. Photo © copyright by Thomas Mangan.